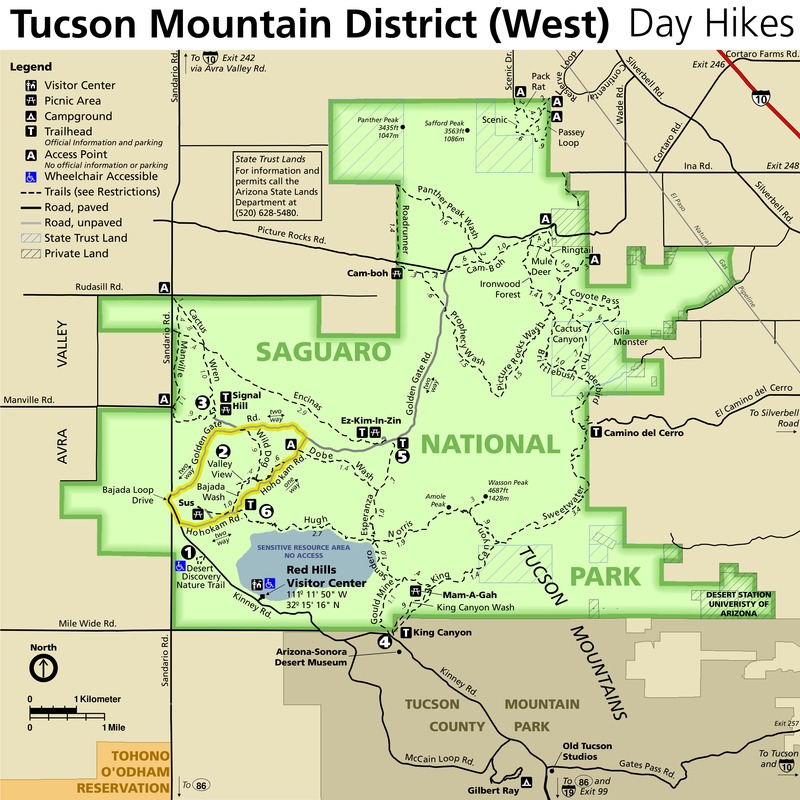 This is another one of the many trails in Saguaro National Park East that does not have a direct accessible trail head, therefore this hike is usually done in conjunction with another trail. 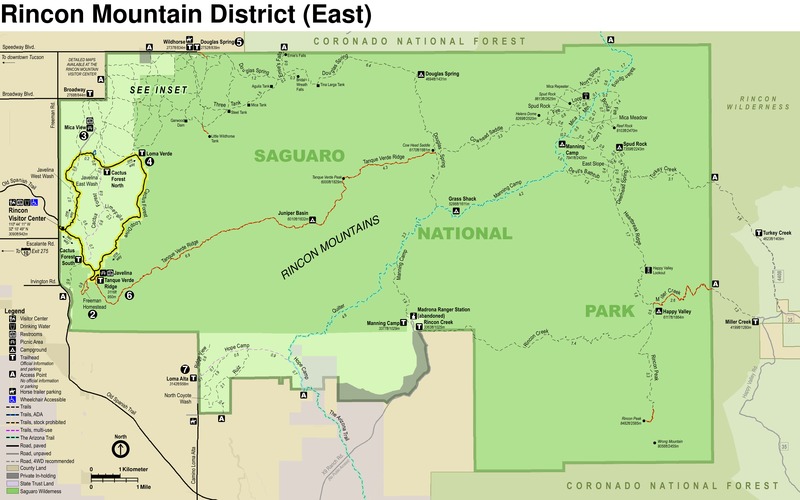 To hike from south to north on this trail the closest trail head would be the Loma Verde Trail on the park’s Cactus Forest Loop Road. Hiking north to south would be from the Speedway Wildhorse Trail Head. 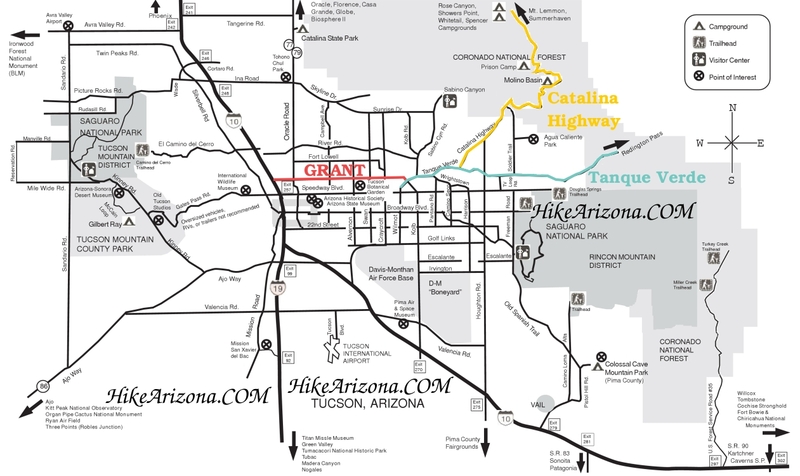 The Squeeze Pen Trail is between the trails to the east that are close up to the Tanque Verde fore range hills and the trails to the west that are along the flatter desert floor, offering a variety plants and cactus from both. 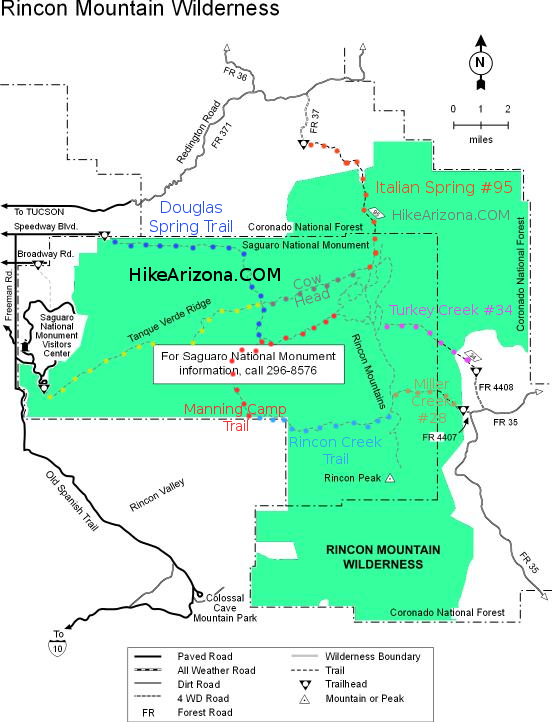 This trail also offers a section through Mesquite forests not found along the more eastern trails. The trail starts out near Monument Wash and crosses Wildhorse Wash, these are two of the three largest creeks coming down off of the Tanque Verde Ridge (The other large Creek is Bajada Wash). From the Park’s Cactus Forest Loop Road at the Loma Verde Trail Head take the Loma Verde Trail. At about .1 miles the Mesquite Trail will head off to the left (west) and is signed. There are quite a few unofficial trails that split off along the first section of the Loma Verde Trail but they usually don’t go very far, stay on the main trail. The trail is well signed so it is easy to follow (unless you do like I did and misread the sign because of a brain lapse). The trail crosses Monument Wash at about .3 miles and just past the wash the Squeeze Pen Trail will head east (This is where I misread the clearly marked sign and continued on the Loma Verde Trail and had to turn around and read the sign correctly this time). The Squeeze Pen Trail will cross two small streams coming off the Tanque Verde fore Range and stays fairly level for 1.2 miles to the Carrillo Trail Junction. From the Carrillo Trail junction the Squeeze Pen Trail follows along a small ridge that separates Wildhorse Creek and Monument Wash. At 1.4 miles the Pink Hill trail heads off to the Left (west) and at 1.6 miles drops in to Wildhorse Wash. From just past the start of the Squeeze Pen Trail to Wildhorse Wash the trail has been very much like the trails on the western end of the park, Creosote, scattered mesquite, Palo Verde and the ever present Saguaro, also very exposed to the sun. At Wildhorse wash the Deer Valley Wash Trail heads off to the left and after another 100 yards the trail crosses Deer valley Wash and the Deer Valley Trail heads off to the right. The Squeeze Pen Trail in this section is less exposed and follows along a Mesquite Tree forest, but not for long, from here the trail heads up out of the Wildhorse/Deer Valley Wash and up on the hills separating Monument Wash to the west from Bajada Wash to the east. At 2 miles the Bajada Vista Trail heads off to the right (East) and shortly after that junction the Squeeze Pen Trail crosses a small stream dropping 30 feet and then climbing back up the other side to the northern terminus of the trail at the junction with the Vanover and Kennedy Trails. From this intersection if you look to the South you can see the remnants of the now abandon Kennedy Trail that use to head to the Carrillo Trail (Named after John F. Kennedy, The trail was originally a road built by the county in the 1960’s for a proposed housing development). If you look east from this intersection, the remnants of the now abandon Wentworth trail can still be seen. This use to also be Garwood's Airstrip. 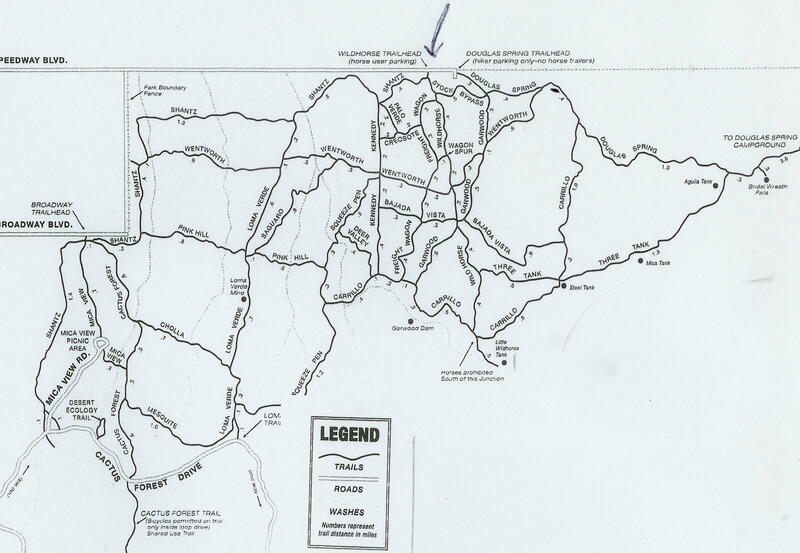 The Wentworth Trail use to go from the Shantz Trail all the way east to the Douglas Spring Trail. The portion west of the Kennedy Trail was renamed the Vanover Trail, The portion east of the Garwood Trail is now called the Converse Trail and the portion in between abandon.